Terky was originally only available during a Taiwan iCoke promotional event. However, Terky's Pet Journal entry was recently updated in Patch 6.2.2. There was no indication whether or not this pet could actually be collected...until now! 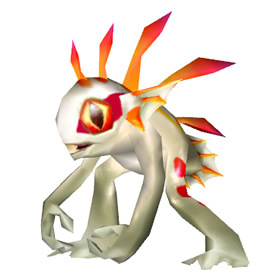 Players discovered and reported the drop location of the coveted White Murloc Egg — an obscure cave off the coast of the Riplash Islands in the southern waters of Borean Tundra, Northrend. Traveling through the underwater passage will lead you into a small cave. Don't be fooled by the large pearl sitting atop an alter. The treasure you seek is actually on the ground in a pile of rocks and bones. Looting the White Murloc Egg will drop a Battle.net bound item of the same name that teaches Terky. It's a wonder how a single murloc egg made its way into this cave, not to mention how someone discovered this hidden treasure! Nevertheless, it's a wonderful surprise to finally have a readily available baby murloc pet in-game. was just having a conversation with a fellow player about how there is no in game murloc without having been apart of an event or something and here this is!! So excited to have my first murloc. thanks warcraftpets.com and thanks for the video wyrdrake! Got mine today. Surprisingly easy with the excellent video posted by Wyrdrake below. Thanks, Wyrdrake! I just acquired this little fella and I am really glad that Blizzard has decided to make some of the pets only available to certain realms or regions collectable in other ways. Finding him was slightly tricky but found a very helpful video that might be useful to those that are still looking for him, it certainly helped me! OMGs I've been wanting a murloc forever and I got my lil' Terky on Ysera and he's soooo adorable! There was no one there so no drama getting him. Got mine today. Just couldn't find it without co-ords. Awesome, and thanks to all who commented. Just got him today! thanks for the information! Thank you to everyone who mentioned the exact location of the egg and most importantly, respawn time. I had some difficulty finding the cave entrance but once I did it was easy! I ran right in, foudn the egg, picked it up and left! There were a bunch of people standing around. It looked like a regular cocktail party. Going in knowing it was a quick respawn I didn't feel the least bit guilty for snatching the egg. Thank you!! I actually feel a little bad about this, as soon as I heard about it, I logged into WoW and rushed into the cave where a bunch of people were waiting around. I saw where the egg was supposed to be and it spawned right then, so I clicked on it ... Got it within about 10 seconds of entering the cave. There was a bunch of yelling in Orcish, so I just left. UPDATE: Apparently it respawns almost instantly, so it's not something you should be concerned about ninjaing. Terky... just in time for US Thanksgiving. Can you cook a murlock in a chicken in a duck in a turkey to make the most amazing turduckenlock? Got mine! Tough going for a while. Saw this headline on Facebook, first reactions was "omgwherewhereWHERE?" lol. First of many previously-LE, one hopes!